When i was young one of my favorite things to do was sit down put a puzzle together. I probably have not done that in over 20 years. Some people put them together as a hobby, or just to relax. This is not the kind puzzle i would want to play with! Its a nice sunny day when we see a lady (Cachito Noguera) answer her phone. Its her son on the other line and she is very upset almost immediately. He would like to borrow money and she is adamant not to do it. She hangs up and is so upset that she sits down to relax herself with a puzzle. The only problem is this puzzle does not relax her at all. It suddenly becomes clear she is putting together the a piece of her life. You will never believe what happens next. 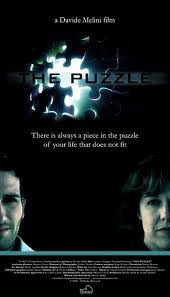 The Puzzle is directed by the Italian director Davide Melini. 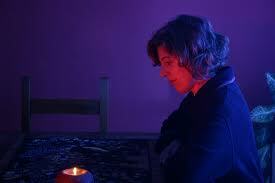 The short film is a mear 5 minutes long but does put together a good storyline. There is really only one person in the film and that is the Mother. The 30 seconds she is on the phone with her son is all the dialogue in the film. The rest of the film is silent, but it does deliver a pretty solid ending. I would comment on the actual acting but there is really not much of it so I don't have that much to say honestly. I did not totally dislike this movie. At the end of the day i would say its not too bad but I have seen plenty of shorts that were much better. The lack of dialogue and some of the camera work makes it a little boring. I enjoyed the ending which i am not going to give away and spoil it for you. You will have to click below on the You Tube link and see for yourself. Stay twisted everyone!